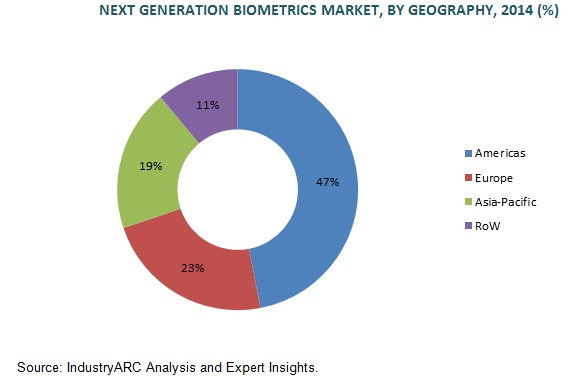 Global Biometrics Market Forecast & Opportunities 2020 (TechSci Research) — The global biometrics market is projected to register a CAGR of around 14% until 2020. Biometrics for mobile devices have finally reached a tipping point. The march began with the release of the Apple iPhone in 2007 and later the iPad, each subsequently matched by Android competitors. These smartphones and tablets finally have enough processing power and hardware capabilities to put biometrics directly into their users’ hands. Biometrics, whether for mobile devices or large stationary systems, typically perform one of two functions: authentication, proving that someone is who they claim to be, or identification, figuring out who someone is. Nearly all consumer-facing use cases are authentication and nearly all identification uses are enterprise-facing, especially government use cases. Somewhere in the middle, financial institutions are offering their users the chance to authenticate to online banking systems with their voices or with their eyes, in place of keying a personal identification number (PIN). ◾The global biometric systems market is estimated to value US$4.4 billion in 2015 and increase at a CAGR of 8.70% during the forecast period, to reach a peak of US$10.2 billion by 2025. ◾The market is expected to be dominated by North America, followed by Asia-Pacific and Europe. ◾Fingerprint recognition is expected to account for the largest share of expenditure in the global Government Biometric Systems market going forward, followed by facial recognition and Iris. That Compounded Annual Growth Rate (CAGR) is probably one of the lowest I’ve ever seen in the biometrics sector. It, however, doesn’t come as much as a surprise. The number of government customers is pretty much capped at around 200. Governments were some of the earliest adopters of biometric solutions, so most of the 200 potential customers are already in the market. Prices paid by these customers, generally, should be falling or stable. So, there are a whole host of reasons for this low estimate for growth in the government biometrics sector. This report examines how biometric technology is applied to the health care industry, mainly in the United States. This report notes that “health care biometrics” is utilized for access control, identification, workforce management or patient record storage. Biometrics in health care often takes two forms: providing access control to resources and patient identification solutions. The growing demand for biometrics solutions is mainly driven by the need to combat fraud, along with the imperative to improve patient privacy along with health care safety. Biometrics are also increasing being used for medical monitoring and mobile health care. – Rawlson O`Neil King Lead Researcher, Biometrics Research Group, Inc.
Also, and unlike with most of these market analyses, Biometrics Research Group has made the entire report available for free via download at the link above.